The Isaac Brock Society | Support the Paul Amendment to Repeal FATCA! The Multilateral Treaty model does include an Article on collection but as I understand it, it’s a kind of pick’n’mix template which countries can choose bits from when negotiating the bilateral treaties through which the CRS gets implemented. The really novel bit is that they all agree that when the model is changed, the changes ripple out to become binding in all the treaties incorporating the changed sections. A bit like the Model 1 IGA provision on changes being offered to all, except with the Multilateral Treaty the changes come into force automatically. So it’s not hard to guess that the US would never sign up to that in a month of Sundays. Interesting to see the JCT document. @escapedslave, thank you for adding that very valuable perspective to educate us on how these US extraterritorial issues harm those in Mexico. That has been a gap here because though we know that the largest population of USPs outside the US is in Mexico, and that there are substantial populations of people affected on both sides of the shared border, (Canada is second in numbers ‘abroad’) we have not had commenters writing here about that context, though we have sometimes posted links to webpages with information as people have found them re Mexico and FATCA and the harms caused by US extraterritorial CBT as applied to those in Mexico ex. http://isaacbrocksociety.ca/fatca-and-mexico/ . As only an anglophone I myself have not been of much use in searching for useful information and articles from contexts outside my own knowledge, and especially from non-English media. ¡Hola escaped slave (one of the many)! I want to thank you very much for your valuable input that MNM will be able to add to the UN Human Rights Complaint. It is well understood by me why you have to choose not to sign but give this instead. I have sent this on to MuzzledNoMore in a separate email. I am sure MNM will be here in time to thank you as well. I haven’t been able to access Keith’s American Expatriates FB for awhile now (not even substituting “m” for “www”). (I won’t join FB because … well just because.) Has he or FB made it a personal page where only logging in gives you access? If so, I wonder why. If there is a FB user here willing, would you mind asking Keith about this? I’m sure he wants to keep spreading the word as far as possible, so it seems counterintuitive to block so many people from the site. OR, is it possible I’m the only one experiencing this block? Me, too. I can’t get access to it using www. I also can’t get it by substituting m. for www using Firefox. But I tried using Edge and the m. prefix worked with that browser. However, doing this I can only see the posts, not the comments, which is frustrating as the comments are usually very informative too. It’s seems counter-intuitive to me, too, to restrict viewing to members only, as it strikes me as the type of group where they’d really want to get the info out to as many people as possible. And personally I really miss being able to read it. I thought maybe it was some new FB policy, but I have been able to access other groups which I’m not a member of. So, I guess it was either Keith’s decision or maybe something is screwed up and he isn’t aware of it. So, good idea you had to ask if someone reading your comment here would ask him about it. Thanks. Escaped slave: Yes, indeed, I add my thanks to Calgary’s and Badger’s for your very timely comment about the effect of the renunciation fee on Mexicans in particular. While the current Complaint is directed specifically against CBT, FATCA and FBAR, the renunciation fee (which many people are feeling forced to pay *because* of those three policies) is definitely an issue that must come before the UN also. I will add your concern to the Support Document for the Complaint that will be sent to the UN on December 15. I will be putting up a new UN Complaint posting very soon. I read this to mean that Denmark will not provide any assistance for a claim in which a Danish taxpayer was a Danish citizen at the time the tax was incurred. I tried our other 2 browsers and no go. We don’t have Edge. I think it might be FB’s fault because they want to censor anti-establishment discussion and American exceptionalism, which Keith challenges, is definitely establishment. Google and YouTube are into this sort of nonsense too. Hopefully someone will get us an answer. Patricia Moon – yes, that’s how I interpret it. I’ve since realized I was misinterpreting the Canadian treaty. Canada also will collect from a resident who became a citizen after the time during which rhe US liability arose, is that correct? Appreciate correction if I’ve misinterpreted again. The treaty language does my head in. This is consistent with the US having no intention of trying to enforce CBT on citizens of other countries. There is apparently no US tax treaty which commits either State to collect the other State’s taxes from a person who was a citizen of the requested State at the time the liability arose. IIRC, mutual assistance was not in the original Treaty, and it was put in in the 1995 Protocol (becoming s. XXVI A of the Treaty and including protection for citizens (at the time the tax debt arose) against mutual assistance). The reference to 1995 was then put in the 1997 Protocol to clearly include the protection to those who were citizens and whose tax debt arose prior to the coming into force of s. XXVI A in 1995, presumably because laws are generally interpreted as being prospective as opposed to retroactive, unless otherwise stated. Thanks, Pacifica777 – got it. It’s good to know that no country will collect US taxes from citizens who don’t file US tax returns. But doesn’t help in cases where the enforcing is basically outsourced to banks or tax advisors. Does the list on the Senate page simply include a list of all submitted amendments, or does it mean they are all swept into the bill now unless specifically eliminated? Dare we hope again? @Barbara: Links below to the Senate bill version that actually passed. Nothing about FATCA in either one. That rpc.senate.gov page shows all submitted amendments. Paul’s amendment is listed in the same status as all the Democrat amendments which also had 0% chance of making it into the final bill: “Introduced”. @Eric: Understood. But my question remains: why are these amendments listed on the “Reconciliation Tracker”? Are they still up for consideration during Senate-House reconciliation proceedings? @Barbara: sorry for my earlier answer, I misunderstood the question & context. 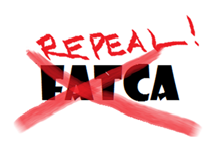 As I understand it, now that House & Senate go to conference with their respective versions of the bills, it would be extremely difficult to get something like FATCA repeal inserted in conference, when it wasn’t in either of the original bills. Specifically, once the bill goes back to the Senate after conference, a single Senator can raise a point of order against the insertion of “matter not committed to them by either House”, and then the Republicans would need a three-fifths majority vote to override the point of order and pass the bill. Since their whole game is to ram the legislation through with the 51 votes they can gather so they can say they’ve done something, I doubt they’d risk it on something as unimportant to them as FATCA repeal. Brock was created (in part) in response to the scaremongering via the US govt, the media and above all, the tax compliance community. We might not be able to do much about the banks but we CAN continue to challenge the misinformation that is emphasized by the you-know-whos……. What a powerful comment! I often think I have heard it all but we really cannot even begin to imagine how this perverse policy plays out in every situation. Thank you for alerting us to this. In your opinion, would there be a way (and if so, how) to connect your community? Patricia Moon – I was thinking not so much about the scare-mongering as situations in which the USC’s financial affairs may end up being handled or heavily controlled by lawyers, accountants, etc. Probate, for instance, which generally requires payment of “all taxes due”; or legal guardianship. Situations in which US tax law will not be ignored, regardless of what the USC would have wished. I was just speaking to Keith and remembered your comments. He has not changed anything regarding the group’s settings nor has he heard/observed anything concerning policies against criticizing the US. (Not having any problem doing that on citizenship taxation group….) Anyways, he asked if you were having the same problem is using a different device? You can’t access on ur PC but can you on phone, etc? My only phone is a landline. Maybe Pacifica has a smart phone. I’m not a FB member but I used to be able to read Keith’s site … now it demands a log in. Here’s the URL for the icon I have on my desktop that used to get me there. HOWEVER, I just did a search for AE and it gave me this URL which works. @ pacifica777 — See if using this URL works for you. I think the problem is solved. It’s possible my husband might have messed up my public access when he used his FB log in on this computer. Thanks Tricia for checking … my ken of all things computer is subpar to say the least.